If you thought all we could see is all that’s out there, prepare to rethink everything you knew. Artist’s logarithmic scale conception of the observable universe. Note that we’re limited in how far we can see back by the amount of time that’s occurred since the hot Big Bang: 13.8 billion years, or (including the expansion of the Universe) 46 billion light years. Image credit: Wikipedia user Pablo Carlos Budassi. Looking out at more and more distant objects in the Universe reveals them to us as they were farther back in time, going all the way back to before there were atoms, all the way to the Big Bang. Image credit: NASA, ESA, and A. Feild (STScI). Inflation causes space to expand exponentially, which can very quickly result in any pre-existing curved space appearing flat. Image credit: E. Siegel (L); Ned Wright’s cosmology tutorial (R). The way inflation works is by causing space to expand at an exponential rate. This takes whatever existed before the hot Big Bang and made it much, much, much larger than it was previously. So far, so good: this explains how we get such a uniform, large Universe. When inflation ends, that Universe gets filled with matter and radiation, which is what we see as the hot Big Bang. But here’s where it gets weird. In order for inflation to end, whatever quantum field is responsible for it has to roll from the high-energy, unstable state that drives inflation down into a low-energy, equilibrium state. That transition, and “rolling” down into the valley, is what causes inflation to come to an end, and create the hot Big Bang. If inflation were a classical field, you’d get inflation for as long as the field value remained large, but as it got smaller by, say, rolling into the valley below, inflation would come to an end and reheat the Universe. Image credit: E. Siegel / Beyond the Galaxy. But whatever field is responsible for inflation, like all other fields that obey the laws of physics, must be an inherently quantum field in nature. Like all quantum fields, it’s described by a wavefunction, with the probability of that wave spreading out over time. If the value of the field is rolling slowly-enough down the hill, then the quantum spreading of the wavefunction will be faster than the roll, meaning that it’s possible — even probable — for inflation to wind up farther away from ending and giving rise to a Big Bang as time goes on. Because space is expanding at an exponential rate during inflation, this means that exponentially more regions of space are being created as time goes on. In a few regions, inflation will come to an end: where the field rolls down into the valley. But in others, inflation will continue on, giving rise to more and more space surrounding each and every region where inflation ends. The rate of inflation is far more rapid than even the maximum rate of expansion of a matter-and-energy-filled Universe, so in very short order, the inflating parts take over everything. According to the viable mechanisms that give us enough inflation to produce the Universe we see, there are many more regions of space surrounding our own — where inflation did end — where inflation doesn’t end right away. Wherever inflation occurs (blue cubes), it gives rise to exponentially more regions of space with each step forward in time. Even if there are many cubes where inflation ends (red Xs), there are far more regions where inflation will continue on into the future. The fact that this never comes to an end is what makes inflation ‘eternal’ once it begins. Image credit: E. Siegel / Beyond the Galaxy. This is where the phenomenon known as eternal inflation comes from. Where inflation ends, we get a hot Big Bang and a Universe — of which we can observe part of the one we’re in — very much like our own. (Denoted by the red “X” above.) But where inflation doesn’t end, that produces more inflating space, which gives rise to some regions that will have hot Big Bangs causally disconnected from our own, and other regions that will continue to inflate. And so on. As vast as our observable Universe is and as much as we can see, it’s only a tiny fraction of what must be out there. Image credit: NASA, ESA, R. Windhorst, S. Cohen, and M. Mechtley (ASU), R. O’Connell (UVa), P. McCarthy (Carnegie Obs), N. Hathi (UC Riverside), R. Ryan (UC Davis), & H. Yan (tOSU). This picture, of huge Universes, far bigger than the meager part that’s observable to us, constantly being created across this exponentially inflating space, is what the Multiverse is all about. It’s important to recognize that the Multiverse is not a scientific theory on its own. It makes no predictions for any observable phenomena that we can access from within our own pocket of existence. 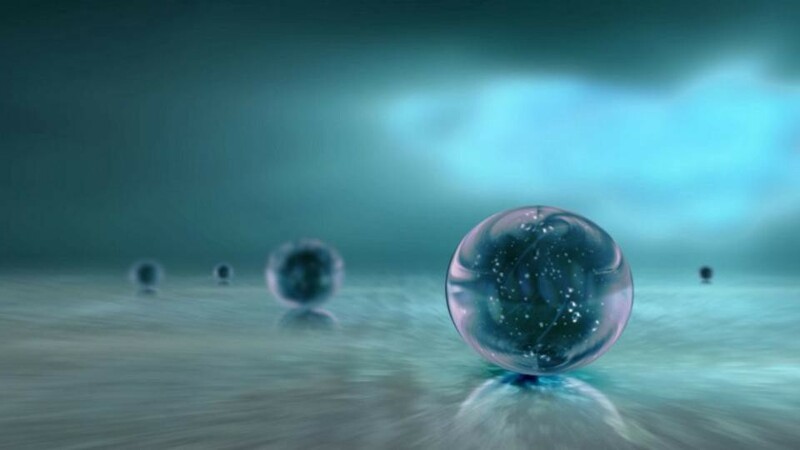 Rather, the Multiverse is a theoretical prediction that comes out of the laws of physics as they’re best understood today. It’s perhaps even an inevitable consequence of those laws: if you have an inflationary Universe governed by quantum physics, this is something you’re pretty much destined to wind up with. While many independent Universes are predicted to be created in an inflating spacetime, inflation never ends everywhere at once, but rather only in distinct, independent areas separated by space that continues to inflate. This is where the scientific motivation for a Multiverse comes from. Image credit: Karen46 / FreeImages. It’s possible that our understanding of the state before the hot Big Bang is incorrect, and that our ideas about inflation are completely wrong for this application. If that’s the case, then the existence of a Multiverse isn’t a foregone conclusion. But the prediction of an eternally inflating state, where an uncountably large number of pocket Universes are continuously born and driven inextricably apart from one another, is a direct consequence of our best current theories, if they’re correct. What is the Multiverse, then? It may go well beyond physics, and be the first physically motivated “metaphysics” we’ve ever encountered. For the first time, we’re understanding the limits of what our Universe can teach us. There is information we need, but that we’ll never obtain, in order to elevate this into the realm of testable science. Until then, we can predict, but neither verify nor refute, the fact that our Universe is just one small part of a far grander realm: the Multiverse. Starts With A Bang is now on Forbes, and republished on Medium thanks to our Patreon supporters. Ethan has authored two books, Beyond The Galaxy, andTreknology: The Science of Star Trek from Tricorders to Warp Drive.